April is no longer just the month that starts the baseball season or the month after the NCAA March Madness basketball tournament, or the time for golfers glued to following the Masters. It is now the month that America can watch the best of the best compete for the national United States Open Pickleball title. 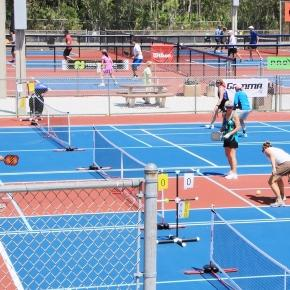 Hosted in the heart of Naples, Florida, from April 23rd to April 30th, pickleball players throughout the nation and beyond will gather for one of the most exciting pickleball events in the world. Not for serious pickleball players onlyThe list of events at the #US Open Pickleball Championship is extensive. Certainly the most coveted and most watched division is the professional side. However, the Open tourney hosts men, women, mixed, amateur, senior, single and double divisions and matches. Participants can expect the highest level of competition within their category, and viewers can be assured that they will be able to watch a variety of top-notch matches of their choice. The US Open Pickleball Championship is still unlike other major sporting championship events. Fans are encouraged to bring their own portable chairs, welcome to bring coolers with food and drink (from the approved list), and are free to bring their pets, leashed of course! This year's venue, the East Naples Community Park, will have a total of 48 courts, and a schedule that will keep all of those courts busy from morning till night.